Living Textiles Company is a leading design house of modern home accessories and lifestyle collections, whose mission is to bring inspiration, innovation, and imagination to every family. The focus of the company is to continue to innovate by designing on-trend pieces to make every baby or child’s room a seamless extension of your home. With Big Apple Buddy’s personal shopping service, you can now buy direct from the Living Textiles online store anytime, anywhere. The Living Textiles Pintucked Jersey Bumper - Grey is an extremely soft jersey bumper with pintucked detailing that adds texture to your nursery. Reversible design allows you to choose between stripped print or the solid grey pintucked side. The neutral colors make it extremely versatile and easy to match with any decor. The Living Textiles Organic Applique Coverlet - Elephant is extremely soft and made with 100% organic cotton and minimally processed. The elephant applique detail is a simple and sweet design for a boy or girl. With no dyes or chemicals in the fabric to create patterns or textures, this coverlet is a must have addition to your baby's nursery. 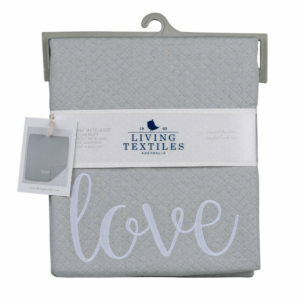 This Living Textiles Diamond Matelasse Coverlet - Grey Love is the perfect bedding piece for your baby. Elegant and effortless, the swan silhouettes sit soft against a light grey setting. 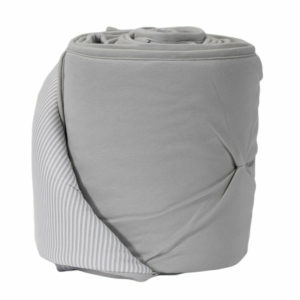 With its diamond pattern-stitching and quilt-like texture, this coverlet will keep your baby warm and snug. 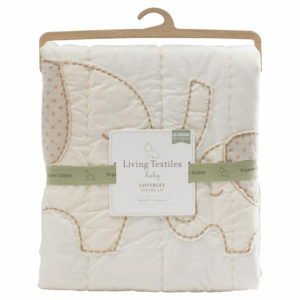 Unfortunately, the USA Living Textiles online store does not currently offer international shipping. However, Big Apple Buddy, your personal shopper, can help you buy products direct from the official USA Living Textiles online store and ship them to your doorstep, no matter where you are in the world. We offer international shipping to over 190 countries including Australia, Austria, Bahrain, Belgium, Bosnia & Herzegovnia, Brazil, Brunei, Canada, China, Croatia, Cyprus, Denmark, Estonia, Finland, France, Germany, Hong Kong, Hungary, India, Indonesia, Ireland, Israel, Italy, Japan, Kenya, Kuwait, Lithuania, Luxembourg, Macau, Malaysia, Maldives, Mexico, Namibia, Netherlands, New Zealand, Norway, Oman, Pakistan, Philippines, Portugal, Saudi Arabia, Scotland, Serbia, Singapore, Slovenia, South Africa, South Korea, Spain, Sri Lanka, Sweden, Switzerland, Taiwan, Tanzania, Thailand, UAE, UK and Ukraine. If you would like to buy from the USA Living Textiles online store, simply let us know which items you would like to order (by filling out the form on the right) and we’ll get back to you with a free international shipping quote within 24 hours!